Benchmarking space – Do you have too much or too little? January 2019 — For this month’s article let’s focus on the most critical benchmarking metric for all FMs: SPACE! If you’re just starting with benchmarking, you should start first with space utilization. Why? You could cut 25% from the operating budgets in utilities, maintenance, janitorial, and security and you will save… 25%. But if you can reduce your space you eliminate 100% of the operating costs, not to mention the cost of the space itself. That is why we want to be sure all the space an organization has is still needed. We also can say that most organizations have some owned space and some leased space. Get the space standards and allocations optimized and you can first shed the leased space. FMs also know that virtually no organization will “volunteer” to give up space. That is why you have to show good benchmarking comparisons and gather support for eliminating space. The usual reaction is, “We can’t cut it any further without impacting our employees’ productivity.” The reality is, you really don’t know if you can reduce space unless you can compare to some similar buildings and see how they are doing while comparing their and your space utilization. These KPIs will show how your space utilization compares with others. But comparing your space utilization with everyone else may give you the wrong perspective on your performance unless the comparisons are made with a relevant peer group. We are using a benchmarking tool to create a chart showing the KPIs listed above based on your criteria. Figure 1 is a chart showing the comparison for office facilities. There are only a few facilities at the extremely low and high ends of the chart. This suggests our data is valid. About 98% of the organizations providing data understood the definitions and measured their space in a manner consistent with the definition. This chart allows you to see at a glance how well your facility is doing with regard to its space utilization. There are 344 buildings in this peer group with a median space utilization of 441 GSF per person and a first quartile performance of about 335 GSF per person. 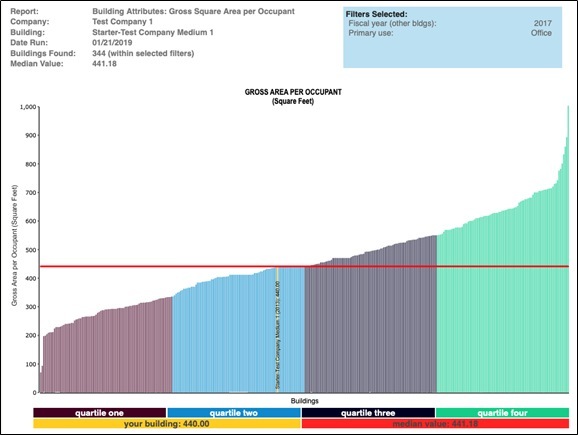 Our building’s performance (yellow vertical bar) is very close to the median at 440 GSF per person. But what would our space needs be if we could improve the utilization to the first quartile performance at 335 GSF per person. Our building’s occupancy is 500 employees so that translates into a space reduction of about 52,500 GSF (440-335 GSF/Employee) x 500 Employees =52,500 GSF. Assume your total operating costs are at the median level (about $12.00/GSF) so you would achieve a net annual savings of about $630,000. By looking at, and comparing similar types of facilities, you will be able to make intelligent “data driven” decisions. If your facility performance is in the third or fourth quartile you will need to investigate further to determine the next steps to take. Is your city among these Top 10 primed for growth in flexible office space? February 4, 2019 In "Surveys and Trends"
See if you can guess what today’s office workers expect in their work environment August 8, 2018 In "Surveys and Trends"
A new kind of FM August 16, 2018 In "Magazines » FMJ"
Moving beyond open plan space November 11, 2018 In "Workplace Strategies » Workplace Evolutionaries"
Tips for promoting collaboration through your office furniture and layout, from HON’s report on office design trends January 14, 2019 In "Surveys and Trends"